Bandy-bandy, Vermicella annulata, either engaged in an alarm display or participating in a game of croquet. Photo from here. The front-fanged snakes are a distinctive clade distinguished, as it says on the label, by their well-developed venom-injecting fangs at the front of the mouth. For a long time, the front-fanged snakes were treated as two families, the terrestrial Elapidae and the sea snakes of the Hydrophiidae. However, it has become well-established that the sea snakes are derived from within the Elapidae, and 'Hydrophiidae' became the elapid subfamily Hydrophiinae. As well as its original quota of sea snakes, the Hydrophiinae also now includes the Australo-Papuan species of terrestrial Elapidae. The sea snakes, as it turns out, are not monophyletic within the Hydrophiinae: the sea kraits of the genus Laticauda form the sister group to other hydrophiines, while the remaining sea snakes form a deeply-nested clade (the Hydrophiini) within the terrestrial hydrophiines (Sanders et al. 2008). Yellow-lipped sea krait Laticauda colubrina, from here. 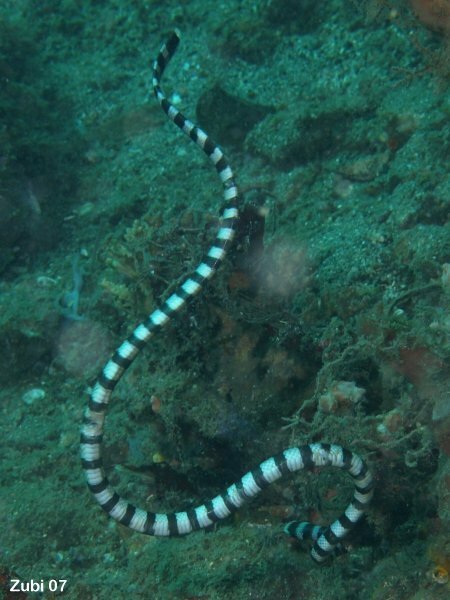 Sea kraits differ from hydrophiin sea snakes in that they still spend part of their lives on land. They hunt and feed aquatically, mostly on eels, with females catching larger, deeper-living prey than males and juveniles (Shine & Shetty 2001). However, after feeding they tend to return to land to digest their prey. Sea kraits also mate and lay their eggs on land. 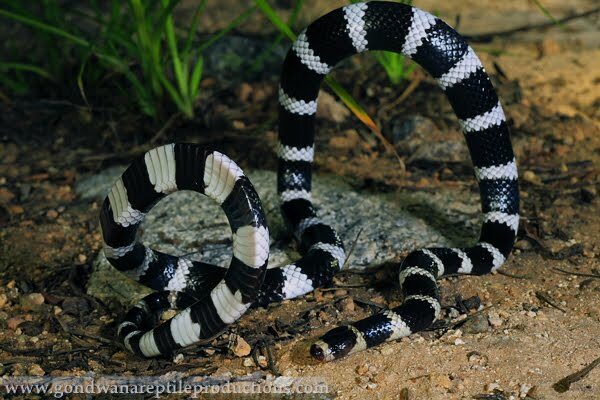 One possible exception has been claimed for the Rennell Island sea krait Laticauda crockeri which, being restricted to an brackish inland lake on Rennell Island in the Solomons, is also one of the few freshwater sea kraits. Laticauda crockeri has never been recorded on land, and the local people claim that it produces live young, reporting that young can be found within females. 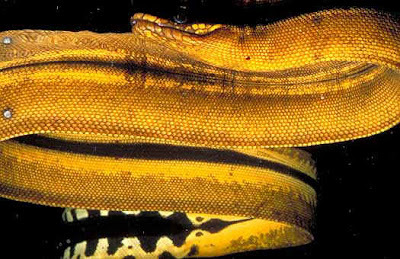 In contrast, a sympatric population of the more widespread yellow-lipped sea krait L. colubrina is correctly reported by Rennell Islanders as a terrestrial egg-layer. Unfortunately, Cogger et al. (1987) failed to collect gravid females in their study of L. crockeri and were unable to confirm the local reports. Yellow-bellied sea snake Pelamis platurus photographed off Costa Rica by Zoltan Takacs. Hydrophiins, in contrast, are truly marine, bearing live young and unable to move on land. Both sea kraits and hydrophiins have deep paddle-shaped tails, but the tail of hydrophiins differs from that of sea kraits in being supported by extensions of the vertebral apophyses. Sea snakes are widely recognised as among the most venomous of living snakes, but are also known as mostly unlikely to bite humans (different species, of course, exhibit different levels of agression); sea snakes do not even necessarily inject venom when they do bite (Senanayake et al. 2005). Two notable exceptions to the high venom strength of most sea snakes are the marbled sea snake Aipysurus eydouxii and the turtle-head sea snake Emydocephalus annulatus, both specialist feeders on fish eggs. Fish eggs, of course, do not tend to put up much of a fight, and the venom strength of these species is less than one-fiftieth that of other sea snakes (Li et al. 2005). They also have reduced fangs and poison glands, but on the other hand they do have stronger throat muscles (improving their suction). 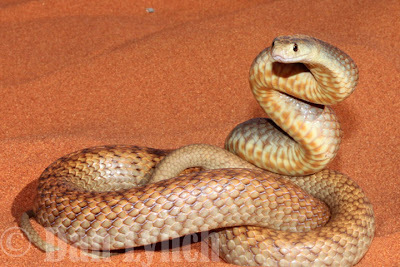 Western brown snake Pseudonaja mengdeni, photographed by Dan Lynch. Among the terrestrial hydrophiines, the Hydrophiini are most closely related to a clade of viviparous species including, among others, the tiger snakes Notechis and the Australian copperheads Austrelaps (Sanders et al. 2008). The origin of viviparity in Hydrophiinae remains unsettled. Scanlon & Lee (2004) found support, albeit low, for a single viviparous clade, but Sanders et al. (2008) found three independent viviparous clades—the large-bodied viviparous clade just mentioned, a second clade of smaller snakes such as the ornamental snakes Denisonia and the hooded snakes Suta, and the death adders Acanthophis as a third clade—but were unable to significantly reject monophyly. Similarly, Scanlon & Lee (2004) posited a single origin for burrowing hydrophiines such as the Vermicella pictured at the top of this post (a specialised predator of Typhlopidae blind snakes), but Sanders et al. (2008) supported two separate clades with Vermicella distant from other burrowing taxa. One thing they did agree on was a close relationship between the brown snakes Pseudonaja and the taipans Oxyuranus. Offhand, in case anyone was hoping that a post on elapids might lead me to a discussion of the... ahem... works of one Raymond Hoser: at one point, I would indeed have happily delved into the subject. But I have to confess that, as time marches on, I find myself increasingly sympathetic to C. T. Simpson's dismissal of the Nouvelle École: "Life is too short and valuable to be wasted in any attempt at deciphering such nonsense". Cogger, H., H. Heatwole, Y. Ishikawa, M. McCoy, N. Tamiya & T. Teruuchi. 1987. The status and natural history of the Rennell Island sea krait, Laticauda crockeri (Serpentes: Laticaudidae). Journal of Herpetology 21 (4): 255-266. Li, M., B. G. Fry & R. M. Kini. 2005. Eggs-only diet: its implications for the toxin profile changes and ecology of the marbled sea snake (Aipysurus eydouxii). Journal of Molecular Evolution 60: 81-89. Sanders, K. L., M. S. Y. Lee, R. Leys, R. Foster & J. S. Keogh. 2008. Molecular phylogeny and divergence dates for Australasian elapids and sea snakes (Hydrophiinae): evidence from seven genes for rapid evolutionary radiations. Journal of Evolutionary Biology 21 (3): 682-695. Scanlon, J. D., & M. S. Y. Lee. 2004. Phylogeny of Australasian venomous snakes (Colubroidea, Elapidae, Hydrophiinae) based on phenotypic and molecular evidence. Zoologica Scripta 33 (4): 335-366. Senanayake, M. P., C. A. Ariaratnam, S. Abeywickrema & A. Belligaswatte. 2005. Two Sri Lankan cases of identified sea snake bites, without envenoming. Toxicon 45 (7): 861-863. Shine, R., & S. Shetty. 2001. Moving in two worlds: aquatic and terrestrial locomotion in sea snakes (Laticauda colubrina, Laticaudidae). Journal of Evolutionary Biology 14: 338-346. Thanks for this. I had always wondered if some sea snakes still reproduced on land. Now I know that some still do like the sea turtles.